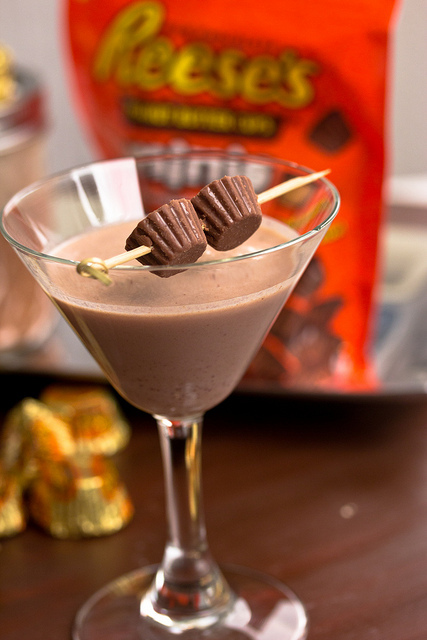 Recipe for Peanut Butter Cup Martini – For the Holidays All You’ll Have is Peanut Butter Breath! I rarely imbibe in alcohol. I get migraines from wine. I get drunk from hard liquor. I can get drunk THINKING about drinking. When I do have a drink I like vodka martinis. Actually I like the olives. I like peanut butter cups better than olives. If I were to drink regularly this just might be my nightcap of choice. To prepare the martini, combine infused vodka and milk in a cocktail shaker filled halfway with ice. Shake for 30-40 seconds and pour into two small (double the recipe and use BIG glasses OR drink it straight from the shaker) martini glasses. Close jar tightly and store in a cool dry place for 7 days. Once vodka has been infused, strain into a clean mason jar (read keg) using a fine mesh sieve or cheese cloth. Eat one PNB cup, take a swig, eat one PNB cup, take a swig . . . continue until all the PNB cups and martini mixture have been consumed. If there are left-over Peanut Butter Cups keeping making and drinking martini’s until the Peanut Butter Cups are completely gone. If there is any martini left, keep unwrapping and eating (as described in step #2) until there is no martini mixture left to drink. Alternate between #3 & #4 until the peanut butter cups and martini mixture are both finished simultaneously. While consuming Reese’s Peanut Butter Cup Infused Vodka do not drive any motorized vehicle, post your picture on Facebook, sign anything or make a video of yourself taking off your clothes, running down the street screaming uncomplimentary things about your neighbors and post on YouTube.